PCB terminals from Premium Quality of Raw material for Highest Condutivity for Optimum Performance Test Data. H.V Breakdown test: 2 KV AC for 1 Min. 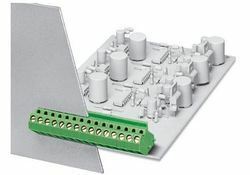 Versatile connection technology PCB connection with an efficient, easy-maintenance, and clear design. PCB terminal block, Nominal current: 24 A, Nom. voltage: 630 V, Pitch: 7.5 mm, Number of positions: 3, Connection method: Screw connection with tension sleeve, Mounting: Wave soldering, Conductor/PCB connection direction: 0 °, Color: green, The article can be aligned to create different nos. of positions! We are a unique entity in the industry, actively committed towards trading and supplying an optimum quality PCB Mount Terminal Block. IC melamine series Power terminal blocks are well suited for applications using wires of large cross section. The design of the terminal block is such that it helps in connection of a fork or ring type lugs. The range includes Terminal Blocks for wire sizes from 16 sq.mm to 120 sq.mm. Our company is one of the well known companies that offer an extensive range of PCB Mount Terminal Block - XY128V-B7.5MM. 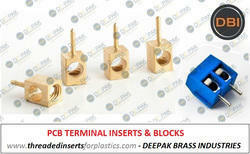 The offered PCB Mount Terminal Block - XY128V-B7.5MM is extensively used in various suitable industrial applications. The offered PCB Mount Terminal Block - XY128V-B7.5MM is easy to use. With huge technical knowledge and practice, we are offering a high quality of PCB Terminal Blocks in several specifications. Moreover, we make sure to deliver these in preset time frame.